Operated by Flottille 11F, French Navy and based at Landivisiau. Seen departing Schleswig-Jagel Airfield in Northern Germany during the 2014 NATO Tiger-meet. Another week, another delay – the Indian Air Force’s fighter procurement crunch might not be over any time soon. 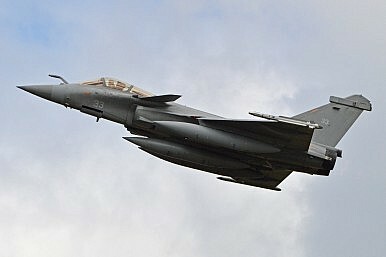 After last month’s announcement that India’s Tejas Light Combat Aircraft (LCA) program is encountering further delays, with final operational clearance postponed to March 2016 (See: “Surprise: India’s New Fighter Jet Faces More Delays”), the Indian Air Force (IAF) may experience an additional setback in increasing its number of operational combat squadrons. According to IHS Jane’s Defense Weekly, industry sources state that the purchase of 36 French-made off-the-shelf Rafale fighters could face delays due to hiking costs and IAF demands to “customize” the platforms. “They said the IAF wanted some avionics and weapon systems in the Rafale ‘modified and reconfigured’ to enable the eventual installation of indigenously developed and commercial-off-the-shelf systems and weapons. This could include India’s 80 km-range Astra beyond-visual-range-air-to-air missile, which is under development,” IHS Jane’s Defense Weekly reports. Furthermore, Dassault Aviation, the French aircraft manufacturer building the Rafale fighter jets, may be unable to meet an early 2016-2017 delivery schedule of the planes due to pre-existing contracts with Egypt, Quatar and the French Air Force, according to defenseworld.net. However, Defense News reported last week that Dassault is in talks with subcontractors and suppliers to the Rafale fighter jet to step up production from one to three planes per month in 2018 or 2019 should India place an additional order for more planes with the aircraft manufacturer. Nevertheless, the source interviewed by defenseworld.net does not believe that increasing the production to three aircraft per month will be adequate to meet the 2016-2017 delivery schedule – the much likelier date will be the middle of 2018. The final contract is still under negotiation and is expected to be concluded by the end of 2015 at the latest. At the beginning of June, Indian Defense Minister Manohar Parrikar told local media that the Indian government intends to only purchase 36 planes. “We are only buying the … 36,” he said. The current contract under negotiation includes an offset clause which stipulated that France will have to invest 50 percent of the contract value as offsets in India. The costs for the 36 Rafale fighters – excluding the maintenance contract and the weapons suite – are estimated at around $4.5 billion. The price is substantially cheaper since Dassault is no longer obligated to build the planes in India as I noted before (See: “Confirmed: India to Buy Only 36 Rafale Jets”). ”In the MMRCA tender, Dassault was to supply 18 Rafales in flyaway condition, and also build 90 fighters in Hindustan Aeronautics Ltd (HAL). Now Dassault is freed of the responsibility to ‘Make in India’. The price they now supply the Rafale at should not just be lower, but at least 30-35 per cent lower than the price which included ‘Make in India,’” an analyst explained.